Though he still needs to be brought into the Fullness of the Truth, he has and is doing his fair share in Evangelizing and making it “Cool” to be down with Christ! How Powerful of a statement would we ALL make if we took to Showing, Displaying and Promoting Our Faith! Here is the article where I “found” this video by Dave Andrusko from National Right To Life: News Today. Here you will find another article, by Jamilah King from Colorlines. Hats off to her article. She brings forth some very good points. If you get a chance, check them out. First, thank you for not just taking the time to read my ramblings, but for taking your valuable time to comment! I am truly grateful. Thank you again and God Bless You and Yours!! I am looking forward to the game against the Pats this weekend. 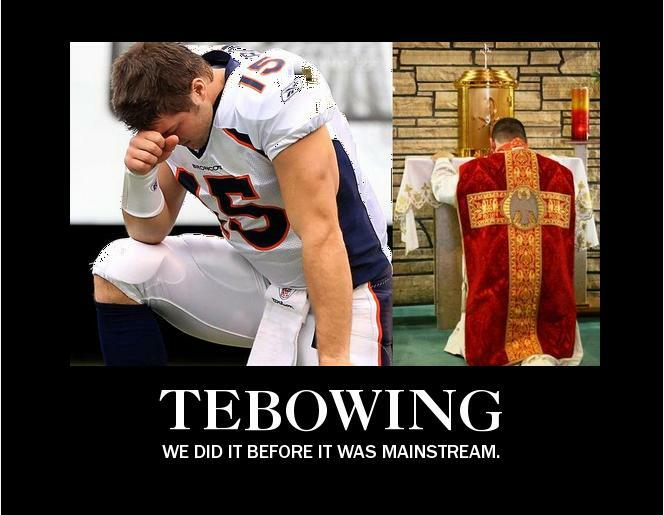 I’m not really that familiar with Tebow’s complete theological views, but, I love seeing him play, as well as Praise God. And ummm, I really dislike the PATRIOTS!! LOL!! NOT at ALL A Pats Fan…I Hope the Giants clean their clocks and serve Baked Beans the rest of the year. I Knew there were MANY reasons why I Loved ‘ya!! God Bless and have a Great Weekend!! Until THE WEEKEND! !